Les Cocottes often gets described as a local version of an American-style diner. I don’t know if that’s true. For one thing, everyone speaks French. And for another, there were no snappy apron-clad waitresses pouring bottomless cups of coffee, no trucks parked outside, and no plumber-cracks hanging over the backside of the stools. After all, this is Paris, ya’ know. In fact, Les Cocottes sits on a pretty prestigious piece of land, in the seventh arrondissement, not known for good-value restaurants, or truckers. But Les Cocottes is a good value, and what makes it even better, the food is worth every centime. Since there were three of us, instead of being seated at the counter, we were led to a high table, to share with two Chanel bag-toting women. (I didn’t look, but I’m sure there were no exposed anythings behind them.) We started with a few starters, including a copious Vraie salade César Ritz. 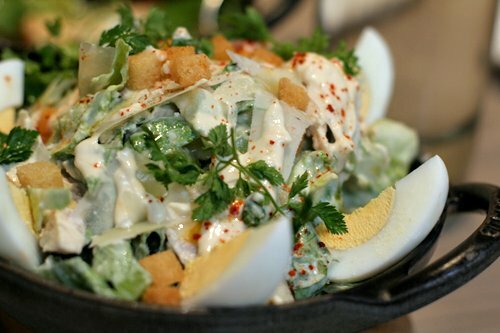 Served in a cast-iron Staub cocotte, like the main dishes to follow, this version was cool, crunchy and creamy, perfectly prepared; bits of tender chicken, ice-cold lettuce, and hard-cooked eggs, with a housemade garlicky dressing spooned over the top. It was priced at around €10, and while eating it, I wondered why the other cafés around town, which serve salads for the same price, have such a difficult time making a simple salad without resorting to canned corn, rice, bottled dressing, and the other stuff they can’t seem to help piling on the plates? Les Cocottes is in a chic quartier, sitting on a pricey piece of land, full-staffed, and with a kitchen full of honest-to-goodness cooks in whites running about. They got all the elements just right. And while it wasn’t a classic Caesar Salad, they get brownie points for pointing out that it’s an alternative version. It was pretty great and I’d certainly brave the crowds lined up here for just for another one of those salads. The main courses are all served en cocotte, each in an aforementioned Staub casserole, which are available for purchase, lest you feel compelled to stick one discreetly in your purse. 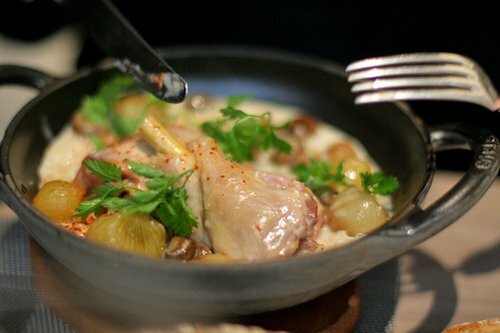 The chicken fricassée was a creamy stew with a moist leg of chicken nestled amongst pearl onions, mushrooms and a hint of smoked pimente d’Espelette adding a faint suggestion of heat, flecked over the top. Most of the cocottes on the menu were hovering €15, with specials climbing a bit higher. We finished by splitting La fabuleuse tarte au chocolate de Christian Constant, which was kinda agreed wasn’t all that fabuleuse: one dining companion compared it to chocolate pudding pie. That’s normally not such a bad thing, but la tarte was lacking the intense deep-dark chocolate flavor we were craving, and that its dense color promised. The crème chantilly, however, was fabuleuse. With a no-reservations (and no clipboard) policy, there’s often a wait because of the popularity of Les Cocottes. We arrived at what I assumed was the sensible hour of 1:45pm for lunch, yet the place was packed and we faced a thirty minute wait. Luckily the crew is on top of things and keep an eye on who’s next. One can order wine, which is very reasonably priced by the carafe, and wait for seats. I recommend stopping by near the beginning or end of service, though, to avoid the wait. When we left, I noticed the crew cleaning the kitchen until it was spotless, and there wasn’t a bit of stainless steel that wasn’t gleaming. That’s always a sign of professionalism and dedication; cooks respectful of their working space. Plus the kitchen uses chervil, one of my favorite, but seriously underused, of all the fresh herbs. (Try some finely-chopped over your next salad and you’ll see what I’m talking about.) 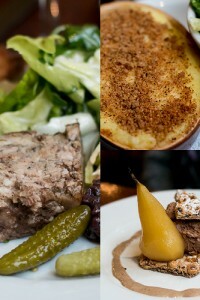 In the winter there’s usually a casserole of game on offer, for those of us who love le gibier. I really want to get some of those little staub cocottes. I have a fascination for little individual serving items. CR: I tried to see if they sold them online via the restaurant, or anywhere, and couldn’t. The ones at the restaurant have glass lids. Staub does make adorable, and heavy-duty small casseroles and I’ve seen them in the states at cookware stores..but also at Marshalls! That Caesar looks absolutely divine. 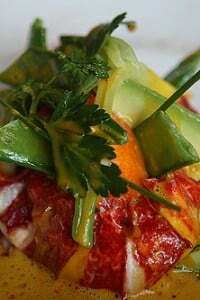 Is that paprika I see spinkled on top? For a second, before reading the post, I thought I was looking at a lebanese salad sprinkled with sumac. Thanks David, will sure to visit when I am there. David!!! Years ago I was spending the summer in Paris with an ex-boyfriend who arranged for a jaunt around Auverne. I had cantal cheese there and fell in love. I still, to this day, call it the best cheese I have ever eaten. After a few years, I began to think that maybe I just dreamed it, but when I saw it on your link from this page, I was thrilled!! What a shame about the cake! It looks so beautiful. I was ready for it to be the best part. My old ‘hood! Too bad Cocottes wasn’t there when I lived around the corner. Perhaps on my next visit…thanks for the virtual lunch. Well, dang! Here I discover a great restaurant in my home territory of the 7th just after I leave Paris. Anyway, thanks for the recommendation, David. And at least now I have a new place to dine when I come back for a visit. I mostly got to know the very homespun local places in the 7th (on side streets close to rue de Sevres, with food like grandmere makes); but this seems like a real find. ACK! Your All Fail Caesar link does not work! and alas! No staub sold here where I live… and Le Creuset costs an arm and a leg! That tart looks absolutely amazing! My parents went there just the other day they were in Paris for “les soldes”…I am telling you, I think we are born with that gene! David R: Thanks for the link. At $59 a pop, I wonder how many of them do get slipped in purses? Fiona: So were we! I think we Americans are used to heavy-duty chocolate desserts while the French palate appreciates more subtlety. 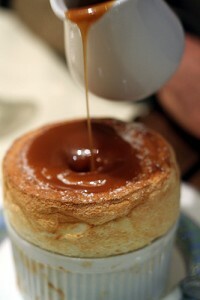 Maybe they should bring a little pitcher of sauce chocolat for les américains! I can actually say I know that neighborhood well, even though the closest I’ve come to that salad is eating one for lunch at a lesser establishment a few blocks away. Love Rue St. Dominique though! I want that salad tonight. 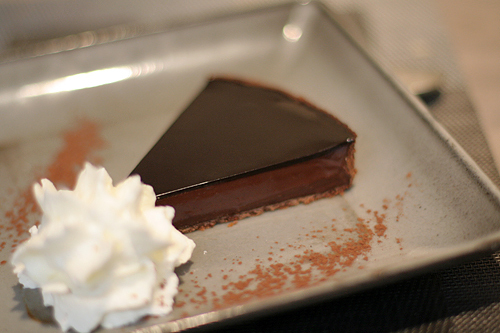 i’m so disappoined about the tarte au chocolat… it looks so perfect! Diner, you say? Having lived all too many years in NJ, a state, known for its diners, more of the typical description you mention about truckers and plumber cracks, any diner would be very appealing. Whether there is a menu of endless choices or chic French cuisine, I truly find them a great place to eat ( and there really aren’t any in MA). I’m jealous and hope that you take a certain couple from WH coming to Paris arriving there early Sunday. I’m sure that they would really enjoy it–aside from the other places that you all frequent. The look of that tarte au chocolat had to make up somewhat for the taste (?) It’s a beautiful presentation. I ate at Les Cocottes twice while I was in Paris. I can’t remember the names of everything I had, but they had a wonderful beef special, a fish with pesto and ratatouille-like vegetables, grilled shrimp with piment d’espelette in a flavorful stew, fantastic oeufs en cocotte, and a very nice salad with a soft cooked egg and lardons. The tuna verrine was interesting, but not my favorite on a cold evening. Prosciutto with melon and figs was fine, but not particularly memorable. That salad looks exquisite! Simple and I’m sure delicious! Is that the “skin” on top of that pudding tart or just a layer of ganache? The underside could be just about any strength if only it were! I’m becoming one of those looking for the more subtle chocolate these days. There is a fine line where chocolate delivers it’s impact with a balance of sweet or creaminess that supports it, I keep waiting for someone to get it right..I experiment and keep notes as well, but am no expert. As I was reading your post the restaurant sounded familiar, then I saw the address and I remembered it from my days at La Varenne. It WAS the only place to get a real salad. Canned corn and rice? Seriously? That’s just… wrong. I’ve been looking (and looking) for a decent place to get lunch in that neighborhood. I’m definitely going the next time I’m in the 7th. Thanks! Dawn in CA — it’s funny…eating corn as corn here just isn’t done — you can buy cans of corn, but no one eats as a side dish. The ears of corn I’ve seen here (few and far between) are dismal — dried out, dimpled, and probably not even fit to feed to animals. But on pizza and in salads? BRING IT ON! No one seems to be able to get enough corn sprinkled over bowls of lettuce or over a pizza. In a salad it’s okay — I’m not a big fan, but I don’t pick it out, either. In pizza, it’s edible — but just weird. Rice in a salad? Yeah, not my deal, either. Sunny: I think perhaps the fascination with canned corn began in the 50’s, after the war. Still, I can’t figure out the lingering fascination with it. I buy fresh corn in Chinatown during the summer and my French friends love it. I also pick up frozen kernels, when available, at Picard and sauté them up with butter, cilantro and chile pepper, which they like a lot, too. A couple of weeks ago, in a café, I had a salade de chèvre chaud which was four triangles of store-bought fluffy white bread topped with four dice-sized pieces of industrial goat cheese. It sat atop a bed of lettuce drenched in bottled dressing, and costs the same as the Ritz Caesar Salad I had above. To be honest, I was a little embarrassed for them. If that was the best they could do in a city full of great bread bakeries (they’re actually 2 blocks from one of the best in Paris) and one where good goat cheese is very easy to find, even in supermarkets, that was quite sad. But if Le Cocottes, which has a full-on staff, and is in a quartier chic can do it, for the same price as the corner café, I don’t know why it’s so hard for others. There are a smattering of places in Paris that now offer salad bar-style salads (which they make for you) but I haven’t been to any. I prefer les classiques and am always on the lookout for good versions of them. We dined here in June – it was great! They accommodated my very picky 7 year old son with a smile on their faces. Mr. Constant brought out our special request (toasted cheese sandwich) and then returned to the table to make sure all was OK with the youngster, and returned a third time to deliver dessert. Talk about feeling like royalty! My husband loved it so much he want back the next day for lunch and ‘had’ to stay all afternoon to finish his wine. A wonderful spot in our favorite Paris neighborhood. Just passing by to post this URL: This is where you’ll find your precious Staub cocottes. What a fab place! Surprising about the chocolate tarte though, since chocolate is such a specialty with him…I love his tablettes. carolg: Yes, it was too bad about the chocolate tart. It does look good, doesn’t it? btw: The chocolatier Christian Constant is a different M. Constant, who owns this restaurant. Leaf: Thanks for the links. The servings dishes are called mini woks, and someone provided a link above to where they’re available in the US. I didn’t see them on the Staub France site (just the 37cm wok) but I do know the restaurant carries them. btw: Staub has outlets in Alsace, although the prices aren’t reduced all that much. If you’re in Paris during les soldes, the department stores often mark many of their Staub casseroles down as much as 30%. thanks for fixing the link… love your tone and writing style! What is it with the the french way of presenting simple food that’s makes it so rustic yet so elegant. And why is it that I find an american eye to “convey” it better than than the french themselfs. L’ élégance no doubt. Ce site est une source d’inspiration! Long (sweet!) life David Lebovits! What is it with the the French way of presenting simple food that’s makes it so rustic yet so elegant. And why is it that I find an American eye to “convey” it better than than the French themselves. L’ élégance no doubt. Ce site est une source d’inspiration! Long (sweet!) life David Lebovitz! Just to update you. The “cocettes” are available from the restaurant when we went last month. The uber efficient friendly waitress spoke very good english. Monsieur Constant was doing a regular patrol ‘quality checking’ throughout the evening. I thought the chocolate tart was sublime! I’m very annoyed at Christian Constant as I bought a kugelhopf from his bakery Rue Madame 6eme yesterday, a small thing, paid 16 euros, and it was not only stale and hard, but totally tasteless. I returned to the bakery about 2 hours afterwards to let them know that they had sold a dud, and they not only defiantly defended their kugelhopf as being “pas vieux du tout” but refused to offer any compensation. Given the amount of breathless praise that CC commands across the blogosphere and the foodie press worldwide, I have to say that I was deeply shocked at their cavalier attitude to customer service and quality. Who can I complain to? I was not only ripped off, but denied a fair hearing. Hi Denise: The Christian Constant that owns the bakery and chocolate shop that you mentioned (on rue Madame), is another person than the chef/owner of this restaurant. (They frequently get confused for the other.) I’ve only had excellent service at M. Constant’s restaurants, and have heard from others who’ve had similar praise for them. It’s unfortunate that the bakery/chocolate shop, which isn’t associated with the Constant restaurants, sold you something that wasn’t fresh. In Paris, there’s not much you can do, as you likely know from living here. They make is nearly impossible to return or exchange anything, even if it’s their fault, as I’ve experienced myself in other places.